An Amazon executive was the person everyone wanted to hear from Thursday night at a panel discussion about the company's plans for a new headquarters in Crystal City. 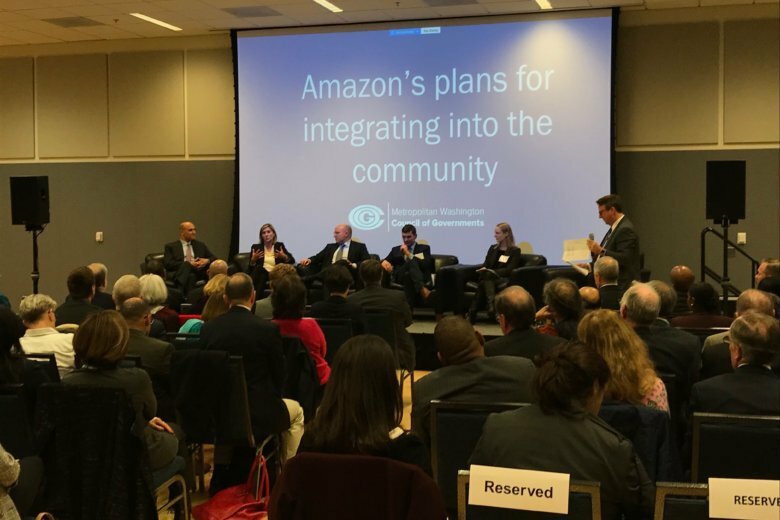 ARLINGTON, Va. — An Amazon executive was the person everyone wanted to hear from Thursday night at a panel discussion about the company’s plans for a new headquarters in Crystal City. The company has said it intends to hire 25,000 people over 12 years, starting this year. And although a few people will probably relocate to the D.C. region from Seattle, “We hope to hire all 25,000 locally,” said Amazon’s Head of Worldwide Economic Development Holly Sullivan. Great transit was one of the things that attracted the company to our region, she said. “In Seattle, over 50 percent of our employees choose another mode of transportation than taking an automobile. We anticipate that to be even higher here. We are a biking company, so we design our parking garages so the autos and the bikes have different entrances,” Sullivan said. Unlike other companies, Amazon chose its second headquarters location before nailing down building design specifics. “Now we’re working backward from that decision on what the buildings are going to look like,” Sullivan said, explaining that the company envisions a neighborhood instead of a campus that will blend in with what exists now. “There’s no walls around it. All the green space is open to everyone in the community. There’s no big sign that says Amazon on it,” Sullivan said. What would happen if Arlington County decided not to give the company $23 million in promised incentives? Would Amazon back out like it did in New York? The discussion was held at George Mason University’s Arlington campus and organized by the Metropolitan Washington Council of Governments.